Striker Benik Afobe's goal kept Wolves' Championship play-off hopes intact and increased Wigan Athletic's woe as they face a last-day fight against relegation. Wolves took the lead when Afobe met Bakary Sako's 25th-minute free-kick to fire home from close range. Wigan would have been relegated had Millwall not let a 3-1 lead slip against Derby. The Latics' relegation will be confirmed if Rotherham avoid losing to Reading on Tuesday, and if the Millers are beaten, Wigan must win against Brentford on the final day of the season to stand any chance of survival. Eighth-placed Wolves, meanwhile, will go into their final game of the season needing to win at home to Millwall and hope results go their way to reach the play-offs. The hosts almost took the lead early on when McClean weaved his way through the Wolves back four, but his shot hit the side-netting, while Jermaine Pennant forced Tomasz Kuszczak to parry his shot away. 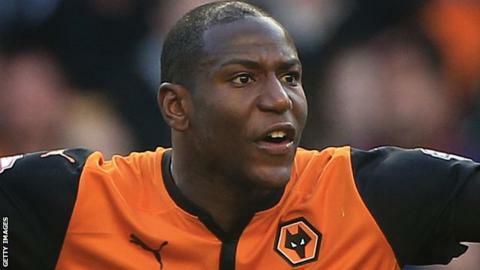 Wolves took an unlikely lead midway through the first half when Afobe scored his 13th goal in 20 games for Wolves and his 32nd of a prolific season. McClean later teed up Emmerson Boyce on the edge of the Wolves box, but he curled his effort just over the crossbar. The visitors had a goal disallowed for Afobe's handball shortly before Wigan midfielder Kim was denied by the assistant referee's flag. Marc-Antoine Fortune had a late effort pushed wide by Kuszczak, before Wigan winger McClean was dismissed for a second booking after a late tackle on captain Richard Stearman. "I thought it was a very hard-fought, competitive, feisty game, as you would expect with Wigan having everything to play for. "They threw everything at us and it's an excellent clean sheet from our point of view. "We played narrow in midfield, forced the ball wide and defended the crosses well. "With Nouha Dicko and Afobe on the break, I thought we always had a threat." "At this stage of the season it's results that you're looking for. "The performance for the first 25 minutes is something I'm sure I'll look back on in the future as the way I want my team to play and express themselves. "In a few days I might be able to look back and be happy, but the result was the most important thing and we didn't get that." Match ends, Wigan Athletic 0, Wolverhampton Wanderers 1. Second Half ends, Wigan Athletic 0, Wolverhampton Wanderers 1. Second yellow card to James McClean (Wigan Athletic) for a bad foul. Delay in match James McClean (Wigan Athletic) because of an injury. Corner, Wigan Athletic. Conceded by Dave Edwards. Corner, Wigan Athletic. Conceded by Dominic Iorfa. Kevin Doyle (Wolverhampton Wanderers) wins a free kick in the attacking half. Kortney Hause (Wolverhampton Wanderers) wins a free kick on the left wing. Billy McKay (Wigan Athletic) wins a free kick in the defensive half. Attempt saved. Kevin McDonald (Wolverhampton Wanderers) right footed shot from outside the box is saved in the centre of the goal. Substitution, Wolverhampton Wanderers. Kortney Hause replaces Bakary Sako. Richard Stearman (Wolverhampton Wanderers) is shown the yellow card. Attempt saved. Marc-Antoine Fortuné (Wigan Athletic) right footed shot from the right side of the box is saved in the centre of the goal. Assisted by Billy McKay. Substitution, Wigan Athletic. Don Cowie replaces Tim Chow. Attempt blocked. Harry Maguire (Wigan Athletic) right footed shot from outside the box is blocked. Assisted by Billy McKay. Corner, Wolverhampton Wanderers. Conceded by James McClean. Offside, Wigan Athletic. James Perch tries a through ball, but Tim Chow is caught offside. Attempt blocked. Billy McKay (Wigan Athletic) right footed shot from the centre of the box is blocked. Corner, Wigan Athletic. Conceded by Ethan Ebanks-Landell. Substitution, Wigan Athletic. Billy McKay replaces Jermaine Pennant. Corner, Wolverhampton Wanderers. Conceded by Scott Carson. Attempt saved. Dave Edwards (Wolverhampton Wanderers) header from the right side of the six yard box is saved in the top centre of the goal. Assisted by Bakary Sako with a cross. Corner, Wolverhampton Wanderers. Conceded by Marc-Antoine Fortuné.